Milk and other dairy products are unfortunately not Paleo appropriate. As a result the search is on for a Paleo friendly dairy substitute. One of the most commonly thought of dairy substitutes is coconut milk. Did you know? The coconut is actually not a nut at all, but rather belongs to the drupe family. If you’ve ever opened a coconut yourself you will know that it is filled with a sweet, water like liquid called coconut water. This is not the same as coconut milk which is actually man made. 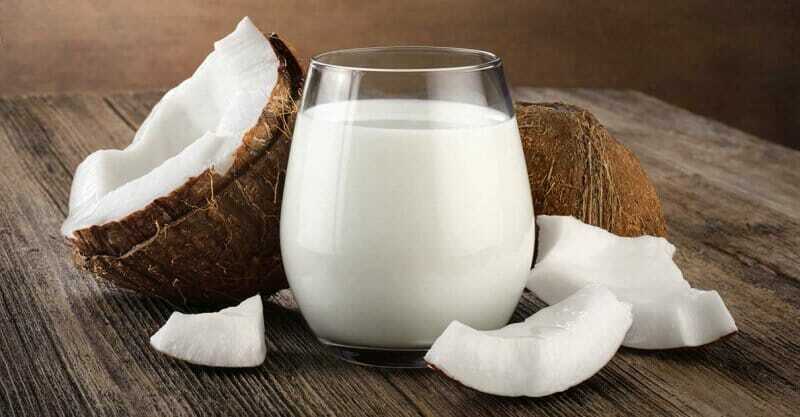 Coconut milk is made from blending the coconut water and the edible part of the coconut. Coconuts are one of natures incredible superfoods in that they provide us with a whole range of the good stuff.Not only are they rich in fibre, but also packed with a range of B vitamins and minerals such as iron, selenium, magnesium, phosphorus and calcium. Coconuts supply the body with a healthy dose of fats, mostly in the form of medium chain saturated fatty acids (MCFAs). The incredible thing about MCFAs is that they are metabolised in the liver and are therefore less likely to be stored as fat in the body. The MCFAs are in the form of lauric acid. Lauric acid is converted into a compound called monolaurin by the body, which is actually an anti bacterial and antiviral. So not only do you receive fibre, vitamins and minerals and a healthy dose of good fats but this delicious product may also protect our body from infections and viruses. So we know it is good for us but is it Paleo? The good news is that even though coconut milk is essentially ‘man made’, it is still made from only the coconut and this makes it Paleo appropriate. Any things to watch out for? If you suffer from irritable bowel syndrome (IBS) it is best to assess your tolerance for coconut milk as it has been known to be an irritant for some. Be aware that certain tinned products and not only plastic may contain the dreaded Bisphenol-A (BPA). In foods which are either acidic or fatty, BPA has been know to leach the product which obviously raises our exposure to it. Even though the research surrounding BPA is not yet conclusive it is best to act with caution as it is an unnatural chemical (4). Finally, not all store bought coconut milks and coconut creams are created equal. Unfortunately as with many products available in supermarkets it is necessary to read the label to avoid low quality products. Watch out for fillers, thickeners and stabilisers which are often added to stop the fat separating out of the coconut milk. The only two ingredients should be water and coconut. To make sure that the coconut milk you are using is completely Paleo, and that you are not exposing yourself to unwanted chemicals rather make your own milk. It is incredibly easy to make your own. That way you can ensure that you know exactly what has gone into your milk. Try these incredible Paleo chicken recipes containing the delicious coconut milk.